Home › News › A rock and roll Panto! A rock and roll Panto! 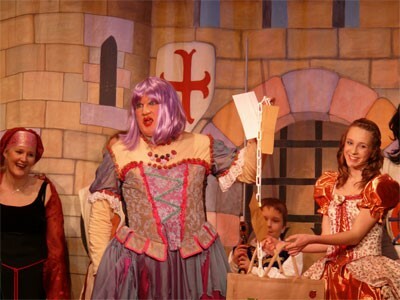 On the opening night of the Ebor Players latest pantomime production, you wondered what they might make of the tale of King Arthur. Would the take try to be early ITV-light, John Boorman black or Monty Python surreal? Well none of these of course, for this is Panto, and the traditions must be observed. And observed they were right from the bright opening musical ensemble before an impressive backdrop of Camelot castle. The innuendos flew thick and fast, and my, didn’t Arthur (Andrew Dunn) have a massive sword for such a nice little comic fella! Guinevere, played as the Dame by David Rose, flounced and bounced right from the start, and somehow you suspected that the darker side of her relationship with Sir Lancelot was not going to be a theme. Lancelot, as the principal boy played by the young and talented Bobbie Parrish-Moreton, had all the long-legged attributes and thigh-smacking poses that originally got the Victorian male all a-flutter. She was clearly going to get the better of the evil witch Morgana (Philipa Parrish) and her fey son Mordred (Tom Davis), but we knew we were in for a fight. Olivia (as a principal girl) was played by another talented young actor Georgina Sykes, and had some good scenes with Lancelot including a duet that got rousing applause. A sparkling-robed Merlin would for me have had a more central role by introducing some more magic, but played by an increasingly confident newcomer John Houseman, he had the Shakespearean device of moving the plot along with rhyming couplets. The sub-plot developed well with repetition and some slapstick around Squirt (Andy Pearce in his usual amiable form), Sally Simple (Tracey Patrick) and a young dragon (Saskia Dunn). 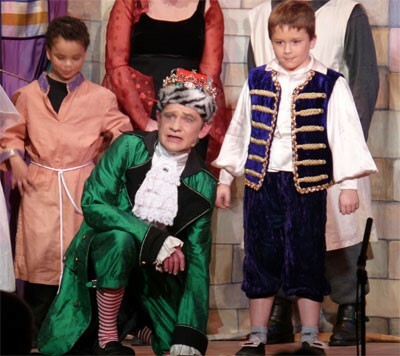 The choruses played their parts well, with the youngest Julian Williams at seven years well capable of his role. In a small auditorium filled with local people, audience participation is always going to be crucial, and on a first night with a large number of adults, a good reaction will lift the cast and raise the momentum of the action. The audience reacted to their cues, and the device of having Guinevere come down and ad-lib her comic way round the stalls early on clearly got everyone involved, though Director Tim Bruce may have wondered about his rehearsed timings! So involved were the audience later on that when the evil Morgana was in full plot mode, Sally asked “behind us?” and a clear small voice was heard to shout out “no – turn your head”. Not for the first time too at this point cast members turned to ad-libbing lines to considerable effect. In every way this first night can be considered a success. The basic script was good, and the inclusion of topical and local references that go back to the days of the Elizabethan theatre made sure that there was something for an audience of all ages and not just from the most recent popular culture. The switching between comedy, the developing of the dramatic plot, the sub-plot and the song and dance routines was perfectly balanced to maintain the pace and development of the entertainment. Given the size of the stage and the wings, the precision of the choreography worked very well, both for the small Ghoul routines and the ensemble set pieces. The sets were painted with élan, particularly the backdrop for the entrance to Morgana’s Castle that was just horrible and original enough to scare the youngest members of the audience. The lighting and sound were good, the principals all had microphones, with the balance between voice, music and audience working well in a less than ideal hall. The choice of songs and the new words written by Chris Higgins (who also choreographed) and Tim Bruce were just spot-on. Over 160 years ago, some people thought pantomime was dead. Here in Bishopthorpe it is prospering, and for a youngster perhaps seeing his or her first dramatic production, there could no better introduction to the pleasure of live action theatre.